A Power That Transcends The Ages! Stretched beyond the confines of space and time, a crack in the cosmos has revealed a slew of ancient alien races, once forgotten to the annals of history. With an unmatched level of conflict experience, these races have arisen from their temporal sleep, preparing to bend the younger races to their indomitable will. In Cosmic Eons, 30 new alien races explode onto the galaxy! Players will be terrified by the Nightmare, pledge their allegiance to The Cult, develop rapport with the Bleeding Heart, and just watch the world burn with the Anarchist! 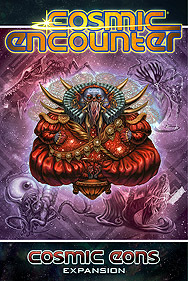 Cosmic Eons is proudly designed by the original creators of Cosmic Encounter. It introduces new alliance dials, which hide pivotal support values of all players, as well as unique essence cards for certain aliens, allowing access to an unprecedented level of creative design space.